Yesterday I deleted several text messages from my iPhone and one of them is very important to me. So I wonder whether I can recover the deleted text messages from iPhone to my MacBook. Any suggestions helpful will be appreciated, thanks in advance. When it comes to recovering deleted text messages from iPhone, iPhone users will figure out different solutions. Many iPhone users like to send text messages to communicate with their friends and families, and sometimes they will delete text messsages on their iPhone to free up storage space. However, when deleting text messsages from iPhone, the users might delete the useful text messsages by mistake. With iTunes and iCloud, users are able to retrieve deleted text messages from iPhone easily. But sometimes the iPhone users only want to recover deleted text messages separately, and don’t want to erase all the settings and contents on their iPhone to restore with iTunes or iCloud. At this moment, a piece of iPhone data recovery software will be helpful. Among all the iPhone data recovery programs, Leawo iOS Data Recovery is regarded as one of the best. 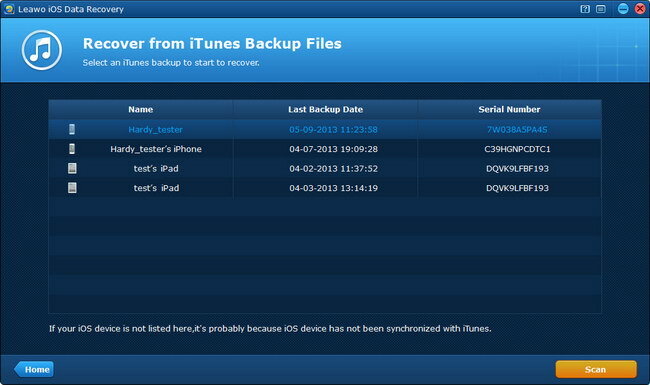 The software is used for recovering deleted files from iOS devices and iTunes backups, and it enables users to backup iPhone, iPhone and iPod touch files to computer. 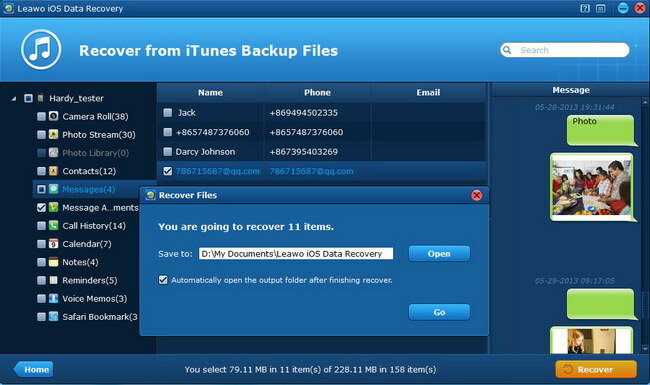 Leawo iOS Data Recovery is helpful when users come up with the data loss in their iOS devices. The following guidance will show you how to recover deleted text messages from iPhone on Mac, and you are allowed to free download the software to have a try. Note that the trial version will stop at the preview window. 1. Run Leawo iOS Data Recovery on your computer, and you will see three recovery modes in the main interface.Choose Recover from iOS Devices and connect iPhone to computer with the USB cable. The program will recognize and analyze your iPhone. 2. After the analysis of the iPhone, Leawo iOS Data Recovery will start to scan the contents in the tablet. It will list 12 categories in the left sidebar, and allow users to choose when the scan is finished. Choose “Messages” in the sidebar, and check “Only display deleted items” at the left bottom, then the deleted messages will show up in the right part of the window. Check the messages you want to recover and click the “Recover” button at the right bottom. 3. After clicking the recover button, you will see a pop-up dialog. Click “Open” in the dialog to choose a folder on your computer to save the exported messages. Then click “Go” to start recovering deleted text messages from iPhone. You will get the recovered text messages in the target folder when the software finishes the recovery process. The text messages will be saved in a CSV file and an HTML file, and can be viewed easily on your computer. 1. After installing Leawo iOS Data Recovery on your computer, run it on your PC and enter “Recover Data from iTunes Backup” mode by clicking it. 2. After a few seconds, the program will display backups of different iOS devices you have ever backed up through iTunes on this computer. Just select the backup you want to recover deleted iMessages from and click “Scan” button to scan the backup for specific contents. 3. After scanning, 12 kinds of data will be listed on the left sidebar, containing Camera Roll, Photo Stream, Photo Library, Contacts, Messages, etc. Tap on “Messages” to preview all the SMS/MMS/iMessages, and click “Message Attachments” to preview all the videos, photos, etc, attached to iMessages. Then mark those messages and attachments you want to recover. 4. After picking out the iMessages you want to recover, click “Recover” to continue, and specify a saving folder by clicking “Open” on the pop-up window, then tap “Go” to start recovering deleted iMessages from itunes backup. Note that the iMessage will be saved in .csv and .html formats when they are recovered and output to computer. 1. Run Leawo iOS Data Recovery and choose “Recover from iCloud Backup” in the window. Then log in iCloud with your Apple ID. 2. 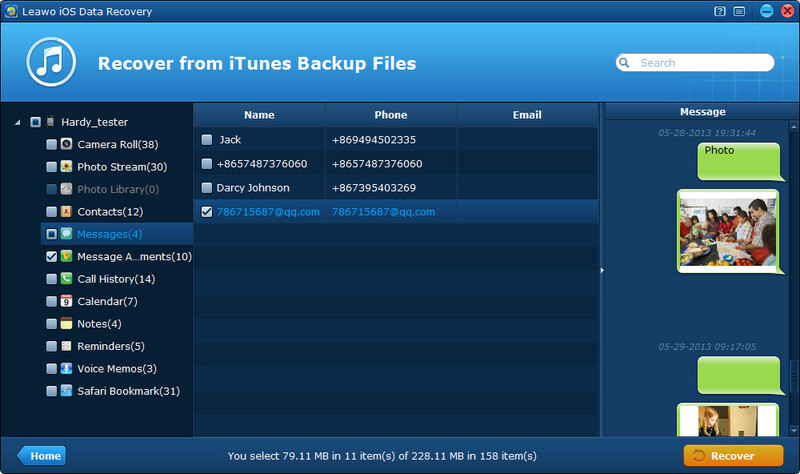 Select your iPhone backup to scan and click “Download” at the right bottom to scan the iCloud backup. Leawo iOS Data Recovery will start to download the iCloud backup. 4. A dialog pops up after the recover button is clicked. Hit “Open” in the dialog to choose a folder on your computer to save the exported files, and then click “Go” to start extracting text messages from iCloud backup. This is the fastest way to restore deleted text messages from iPhone. But you will probably get other data back to your iPhone after restoring it. The backup you created with iTunes will contain all the important data of your iPhone, and when you restore your iPhone, you will get the data that may be out of date back to your iPhone. 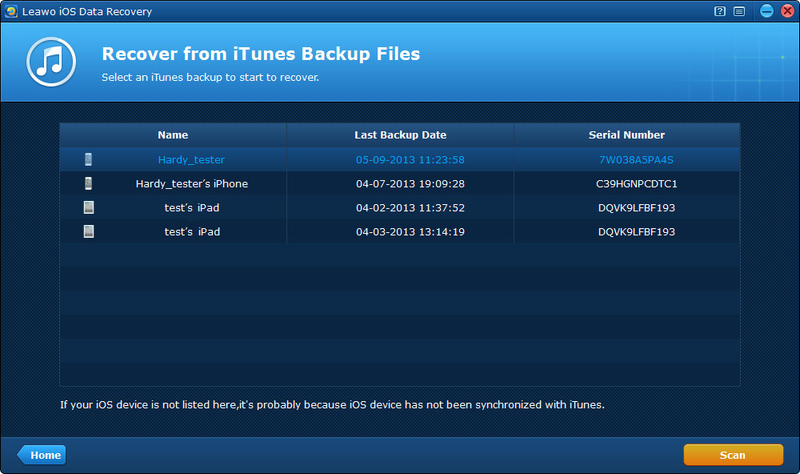 If you don’t have backup in your iTunes, you may want to try iCloud. If you open iCloud on your iPhone, it will upload the latest information in your iPhone to the cloud over Wi-Fi connection. 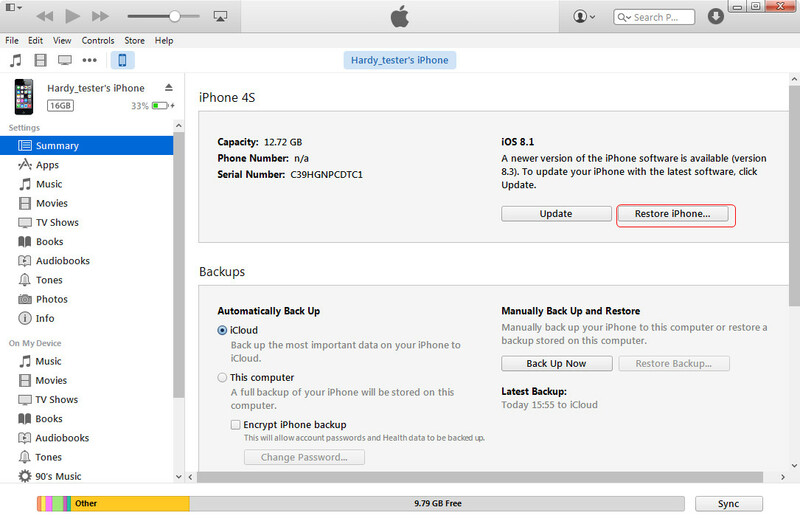 You only need to go to Settings on your iPhone and then tap iCloud > Restore iPhone. Note that if you restore your iPhone with iCloud, it will require you to erase all the contents and settings on your iPhone, if you have files that are not purchased from iTunes, you may not be able to find the files back. Leawo iOS Data Recovery is helpful for various kinds of data recoveries of iOS devices, and it also helps to backup iPhone, iPhone and iPod touch files to computer. For example, you are able to backup iPhone contacts to computer with this program. If you are interested in this software, just free download it and have a try.